I added the $3 wall mirror to our front entry and love the coziness it adds. I decided not to paint it and am glad I left it as-is. Isn't it fun when something so simple makes a space feel complete? (By the way, yes that is a real, live plant there on the floor within demolishing distance of the cats. Minnie chews through it so furiously that I think she believes there is a jungle on the other side just waiting to be discovered). I love that little mirror with its fab hooks. Our cat leaves the plants alone. But my boys use their toy dinosaurs to gnaw through the leaves of them... Not the meat-eaters of course! "Just the herbivores, Mum." 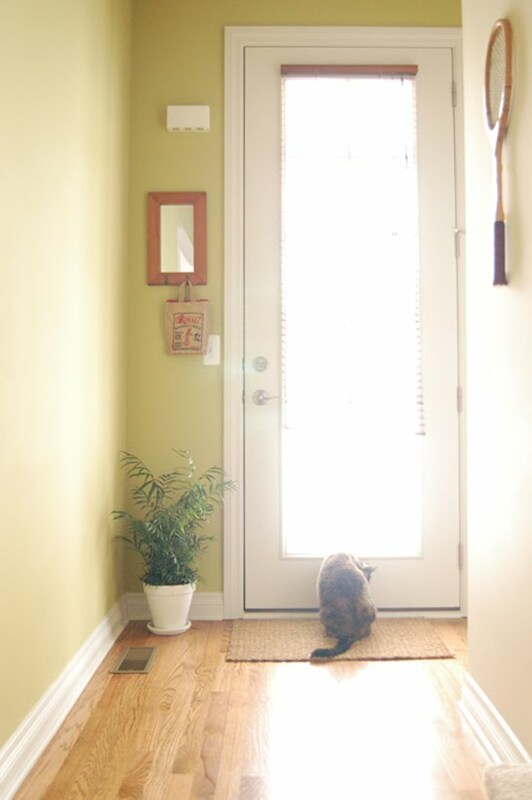 I love this picture of your entry with the light shining in. I bet Minnie loves it!! Yay on leaving the mirror - it looks perfect there. Love the mirror there! (And your racket on the other wall!) You $3 went so far; the mirror really works so well in that spot! The mirror is perfect and I love that it has hooks!